Life has been busy here this summer. We’ve barely kept our house clean or our children for that matter. Our primary focus was our garden and our animals. Here’s what we did this summer. Harvested 15 meat birds and several roosters in our backyard and still have the feathers around to prove it. Back in the 1990’s my father and I were getting into amateur astronomy. We had a pretty cool telescope (Meade LX200) and would spend evenings finding all sorts of galaxies and nebulae. It was a ton of fun, and we were nerds about it too, forcing everyone in the house to keep the lights off so our night-vision wasn’t ruined. Also, if we needed to run inside the house to get something, we’d wear two pairs of sunglasses. Since that time I’ve been on the email list Spaceweather.com (sign up here) where you are kept abreast of the current happenings in outer space, such as comets, near earth asteroids, meteor showers, and solar flares. Another great email alert system comes from the Australian government (sign up here). This is a timely article because we are entering another peak in solar activity, which follows a very predictable 11 year cycle. More frequent alerts are coming and they are sometimes difficult to understand, so I wanted to share some information and resources. The flares are measured as soon as they occur and are given a strength-based label , C, M or X. Class C and Class M flares are frequent and don’t really cause much noticeable interference, unless you are a ham radio operator working on the very high frequencies. X Class flares are much more rare and depending on their size and direction, they could cause a lot of damage. What does this have to do with homesteading? Well, let me just tell you by sharing an example of the extreme so that you can make sure you understand this terminology and be prepared. The largest solar event in recent history was in 1859 and has been termed the Carrington Event. See this wikipedia article for the full scoop, but for now just know that it was a solar flare that caused telegraph lines to become charged to the point where operators were shocked and some stations even burned down. The interconnected telegraph lines acted like a giant antenna and focused this inbound energy from the sun. In our hyper-technological age, the effects of a storm of that magnitude would be devastating to our vastly larger and increasingly interconnected power grid. The result could be short or long term power outages, depending on the level of severity. 2003 – The Halloween Storms – a series of flares send CME’s towards our planet creating heavy disturbances in high frequency radio transmissions. Also, the Wide Area Augmentation System used by the FAA to provide navigation information to aircraft was put out of commission. Flares measuring X10, X17 and X28 were recorded. The X28 was not earth directed, though. The damage was caused by the X10 and X17. 2000 – The Bastille Day event – X5 class flare launched a CME towards Earth causing a large geomagnetic storm. No damage reported. 1989 – On March 6 an X15 class flare occurred, resulting in a CME that hit our planet on March 9. This was strong enough and direct enough that the power grid in Quebec collapsed for 9 hours. I use the above as a reference when reading the alert emails I receive. Knowing that we only need be concerned about X class eruptions rules out most of the notifications. What can we do about it? Be informed – Subscribe to the above alert systems. When a large flare produces an earthbound CME, unplug sensitive electronics. Reduce grid dependency – heat your home and cook with a wood stove, that kind of stuff. You never know what may happen in the future, and knowing how to perform basic homesteading tasks could serve you well. This answers one of the ‘why’ questions on why we try to learn the old ways of doing things. Its not only fun, but does serve as a backup plan for the unknown, no matter how small the risk. Fleas! Yup we’ve got ’em. We discovered about a week after moving in that one of the rooms in our house had a flea problem. And it wasn’t from our dogs, they seem fine and they aren’t allowed in the bedrooms. I gave them each a good bath though, just to be safe. So what do you do, especially if you ‘re a hippie like us and refuse to use those highly effective but dangerous aerosol flea bombs? For the record, a friend who spent some time working at the CDC told us the flea bombs are very dangerous and that young children have died from being exposed to the powder that comes from them. There are a few ways of dealing with this naturally. Vacuuming – Courtney read that fleas are activated and hatch when they sense heat and vibrations. Since we moved in, we’ve kept the thermostat higher than it was while the house was vacant, and simply being in those rooms probably causes enough vibration to bring the fleas out of their eggs. A vacuum cleaner causes plenty of vibration. Running that baby today will cause a large hatch over the next few days. So the idea is to vacuum every day for 21 to 30 days or so and you will capture the entire life cycle of the fleas and then be flea free. That seemed like a lot of work to us. Then we learned about borax. Sprinkling borax around the edges of your room(s) will kill the fleas in any stage of life. Let it sit for a day and then vacuum it up and you should be rid of them. We did that and let it sit for four days. Diatomaceous earth is another chemical free option, but it must be combined with vacuuming and be reapplied after each vacuum session. The diatomaceous earth is a powder with very sharp edges and cuts the fleas as they move past it and then they die. It would be the equivalent to us humans of taking a bunch of broken glass and spreading it all over the floor and having to walk barefoot. I also spread diatomaceous earth everywhere along with the borax. We’ve done the final vacuuming and moved the furniture back into that room. Neither Courtney nor I have seen any signs of fleas in the past week, so we count this treatment as a success and give it our highest recommendation. News Alert: We’ve got our homestead! Time for a big announcement: we’re northern Colorado landowners! We’ve been very patient and been praying for our own little place and we’ve found it. 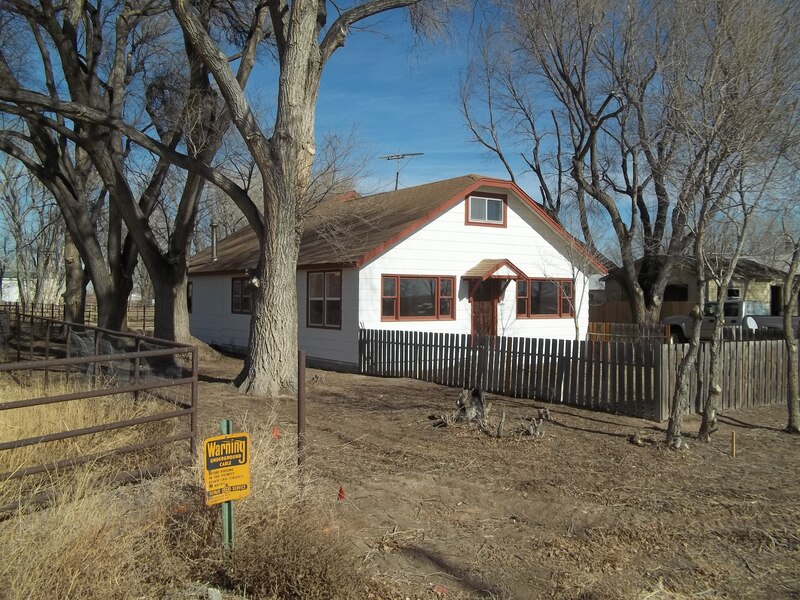 This cute little 1946 home comes with a little over one acre of flat land out in the country in a prime agricultural area. Our blog won’t be as active for the next week or so as we get settled in, but we’ll be back to share more of our adventure with you.